Lewis Hamilton was at fault for his Spanish Grand Prix collision with Mercedes Formula 1 teammate Nico Rosberg and should reconsider his first-lap tactics, according to Sir Jackie Stewart. Hamilton got a run on his teammate, who had taken the lead at Turn 1, on the opening lap at Barcelona after Rosberg lost power because he was in the wrong engine mode. 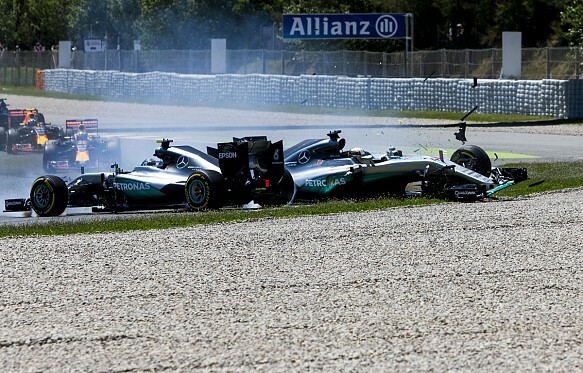 As Rosberg moved to defend out of Turn 3, Hamilton was squeezed onto the grass and spun out of control into his teammate. Mercedes chief Toto Wolff said it was not clear-cut who was to blame and the stewards deemed it a racing incident. Speaking to Autosport in the days after the collision, three-time F1 world champion Stewart said: “Lewis Hamilton was to blame. “It’s unacceptable for drivers with experience to have an accident on the first lap, none of the big guys ever did that. You didn’t see Juan Manuel Fangio, Sir Stirling Moss, Jim Clark do that. One of the major assets for all the great drivers is their mind management. Stewart said he hopes Hamilton has learned a lesson and will consider the ramifications of such a move on his team in the future. “I hope he has learned a lesson,” said Stewart. “It was a spontaneous movement by Lewis that if he were to think back on it, he wouldn’t have tried it again. He needs to think about what happened in Spain, he has to consider the ramifications to his employers. The damage that it caused to Mercedes is the combined total of those drivers, as they would have been first and second. He has to rethink his complete attitude towards what he is responsible for and that applies to every top-line driver.